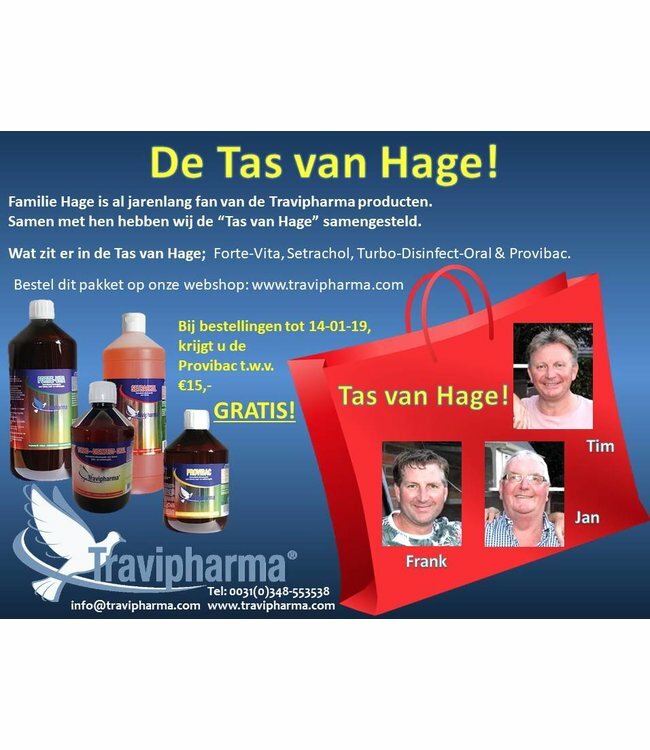 The Tas van Hage contains all the favorite products of the Hage family. They use unique combinations of these products to improve the health and performance of their pigeons. They even managed to prevent having to use anti-biotics for several years now. We interviewed the Hage family and they shared their best practices. This product activates the body and brings it in top condition. It is advisable to use Forte Vita after an antibiotic cure against intestinal disorders and for the overall resistance. - Takes care of the muscles after physical exertions. Oral solution. Setrachol is an unique liver tonic that benefits the recuperation after performances. This product nurtures the muscles after physical exertion and brings the pigeon in top condition. It is advisable to give Setrachol after the racing period and after antibiotic treatment, in case of absence of good breeding results, or at kidney, liver, and digestive problems for perfect detoxification. - Detoxifies the liver and the blood. Powerful herb extract for pigeons and hobby animals. Positive influence as total disinfectant against micro-organisms in the digestive tract and the respiratory tract. After years of extensive testing, Travipharma now has a world premiere! And, to be precise, in the natural control of most harmful pathogens that occur with pigeons: the Protozoan and bacterial pathogens. At Travipharma, we succeeded in curing your pigeons and retain them healthy with our new product: TURBO DISINFECT ORAL!! We have already achieved amazing results due to the power of this natural product. These results are immediately visible when observing the texture of beautiful round "marbles manure" in the hatcheries. Even with nesting couples. This indicates that the pigeons possess a healthy digestive system. In addition, the pigeons will become as soft as silk and slide right through your hands. Provibac is a unique natural feed additive. It contains fructooligosacchariden, a vitamin complex and more. It can be administered through water dropping. It maintains a good bowel flora. Provibac is a probiotic that strengthens and builds the intestinal flora. This specific nutrient gives harmful bacteria no chance to attach in the intestines to make the pigeon sick.